This book compiles recent advances of evolutionary algorithms in dynamic and uncertain environments within a unified framework. The book is motivated by the fact that some degree of uncertainty is inevitable in characterizing any realistic engineering systems. Discussion includes representative methods for addressing major sources of uncertainties in evolutionary computation, including handle of noisy fitness functions, use of approximate fitness functions, search for robust solutions, and tracking moving optimums. This book provides a compilation on the state-of-the-art and recent advances of evolutionary algorithms in dynamic and uncertain environments within a unified framework. The motivation for this book arises from the fact that some degree of uncertainty in characterizing any realistic engineering systems is inevitable. Representative methods for addressing major sources of uncertainties in evolutionary computation, including handle of noisy fitness functions, use of approximate fitness functions, search for robust solutions, and tracking moving optimums, are presented. 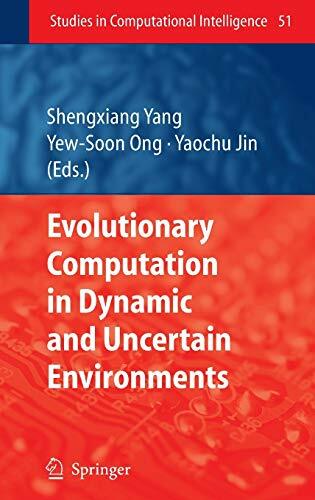 "Evolutionary Computation in Dynamic and Uncertain Environments" is a valuable reference for scientists, researchers, professionals and students in the field of engineering and science, particularly in the areas of computational intelligence, natural computing and evolutionary computation.